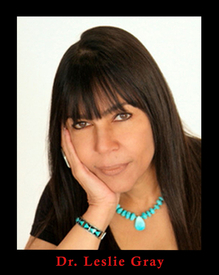 Dr. Leslie Gray, executive director and founder of the Woodfish Institute, is a Native American psychologist who has studied with medicine people and elders from various tribal backgrounds. She advocates (and embodies) a new vision of health care—the integration of ancient healing and modern medicine. Dr. Gray has a private practice in San Francisco, California, teaches workshops and seminars worldwide, and conducts travel/study programs to ancient sites. She has lectured at various universities including the University of California at Berkeley and the Institute of Transpersonal Psychology. She consults with individuals and organizations on the practice of ecopsychology, and her work has been featured in such periodicals as East-West Journal and Re-Vision Journal, as well as in the book Ecopsychology: Restoring the Earth, Healing the Mind. Dr. Gray has served on the board of directors of the Association for Transpersonal Psychology, and is currently an Associate of the Milton Erickson Institute of the Bay Area.